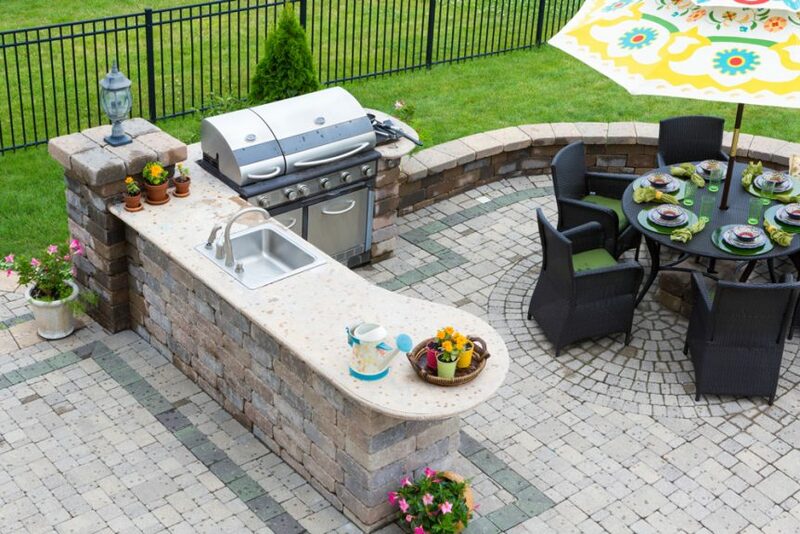 Are you considering adding an outdoor kitchen to your home in Orlando? While exciting, it can be a bit overwhelming to know exactly what you want to incorporate in your outdoor space. Luckily, you can learn from the experiences of other homeowners who have been in your shoes. Keep reading to learn more about some of the top trends that homeowners love including in their outdoor kitchens in Orlando! Top of The Line Grills: One of the biggest essentials to include in your outdoor kitchen is a top of the line, professional-quality grill. Much of the cooking you will do in your outdoor kitchen will likely happen on a grill, so you want to be sure it’s a good one. While there are ways to save on costs without sacrificing quality in other areas of your outdoor kitchen, purchasing a poor grill is not one that should be considered. Do your research to make sure that the grill you purchase will be suitable for your grilling needs. Also consider what types of food you want to grill. Some grills have the option to include accessories such as a rotisserie, sear station, and smoker box. Consider whether these are items you would use, and if so, purchase a grill that can accommodate these accessories. Multiple Cooking Surfaces: Many people who have outdoor kitchens have found that they have need for more cooking surfaces than just a grill. Considering that it is an outdoor kitchen rather than a grill, that makes sense. Including other cooking surfaces such as side burners can be a solution to this problem and help to make sure that while you are grilling, you can also heat up your favorite sauce or cook your favorite side dish! A True Kitchen: In the spirit of including multiple cooking surfaces such as side burners, a very practical trend in outdoor kitchens is to transform it into a full kitchen. Including items such as stainless steel storage drawers and a sink can make your outdoor kitchen more practical, which will prevent you from having to run between your indoor and outdoor kitchens while cooking and allow you to spend more time enjoying your family members or guests. 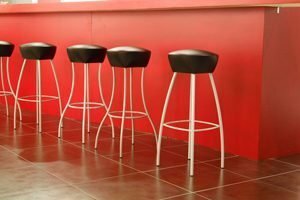 Bar-Style Seating: While patio tables and other outdoor seating options can certainly be very functional, bar-style seating is becoming a more popular request by homeowners investing in outdoor kitchens. This is because, just as with an indoor kitchen, bar-style seating creates a communal atmosphere that allows for more open interaction. Including bar-style seating in your outdoor kitchen can help make entertaining much more enjoyable for you as the host by helping you feel as though you are participating in the party rather than just preparing food! Entertainment Systems: Another feature that homeowners enjoy in their outdoor kitchens is an entertainment system. Entertainment systems can include everything from a sound and stereo system for playing music to WIFI access to a full television system where friends can gather to watch the game. This can add a whole new realm of possibilities to what kinds of parties and events you can host in your outdoor kitchen. Inviting Lighting: Lighting can be truly powerful in its ability to set a certain mood, and it’s no different in your outdoor kitchen and entertaining area. Warm, yellow-toned lights, such as fairy lights, can create a soft and glowy ambience in your entertaining space. Lights that are more bluish or cool-toned, on the other hand, can give your outdoor kitchen a more urban or club like atmosphere. There are also remote-controlled, color-changing LED lighting systems that homeowners can have installed, which gives more flexibility. 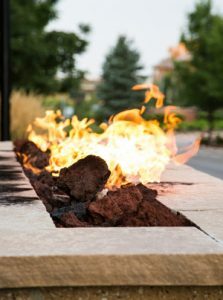 Fire Features: Fire features such as fireplaces and firepits are currently a huge trend in outdoor kitchens. Not only do they look elegant, but they serve several practical functions as well. If outside on a cooler evening, fire features can provide much-appreciated cozy warmth. Fire features can also be a fun place to gather and roast hot dogs or marshmallows! These activities can be a great end to a night of outdoor entertaining or serve as an occasion to have guests over in and of themselves. Pre-Built Grill & Bar Systems: Homeowners are also loving the option to purchase pre-built grill and bar systems for their outdoor kitchens as an alternative to having everything custom-built. Pre-built outdoor kitchens from Paradise Grills, the largest manufacturer of grill and bar systems in America, are a fantastic option for Orlando area homeowners who want a luxurious outdoor kitchen without a luxurious price tag. Paradise Grills offers five different grill arrangements and six different bar arrangements that are available in a variety of finishes. Outdoor kitchens from Paradise Grills also come with all of the trends listed above available as options! To learn more about the outdoor kitchens offered by Paradise Grills, visit the Windermere Showroom or call their customer service number at (800) 691-7155 today!